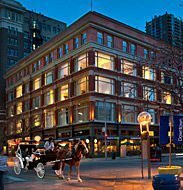 Dazzle’s historic new location at the Baur’s building at 1512 Curtis St. in downtown (LoDo) Denver, Colorado offers the perfect accommodations for all of your private party needs. With a capacity of up to 300 people, large parties can comfortably enjoy themselves in our beautiful venue. We can provide a wide array of libations for your custom, cash or open bar. Book your own or have us do it for you. We have access to local and touring acts. A built in dance floor in front of the stage for your guests to dance the night away! Fun for the whole party! Document your event and capture special moments! We pride ourselves on being a safe space where people of all races, creeds, religions and orientation, are welcome. You can rest assured that our space will be a place of comfort for you and your guests during your time with us. Dazzle is home. Dazzle’s main room can accommodate up to 300 guests for cocktails/mingling and up to 225 guests for seated parties. Patrons renting the main room will have access to the Gallery space and have the entire venue to themselves as a main room rental is a total buyout of the venue. For smaller parties that do not require the entire space, please see our Gallery. *The price of a buyout is based on the number of guests and services that are requested and requires a minimum food and/or beverage purchase. "The new Dazzle experience is something to behold. The old Baurs restaurant has been transformed into what feels like a show club that is worthy of the talent that comes to Denver or is in Denver along with fantastic food." "Delicious selection of food, happy people, Jazz trio played in both rooms. Waiters were pleasant and helpful." "I was very impressed with the facility, and especially the people who worked there. Everybody was so gracious and helpful! Of course the music was wonderful (which I participated in), but I think my greatest impression was the people who worked there." "The drinks are fantastic, and the food...oh my word! The atmosphere is the best I've ever encountered. I love sitting in the booth, lights low and jazz playing in the background. This past weekend we bought tickets to the show and sat in that area for the first time, and it was fantastic!" The Gallery is a beautifully appointed private space that can accommodate up to 50 people for seated events and up to 75 for mingling events. The room lends itself perfectly to acoustic performances, as well as meetings, ceremonies, baby and wedding showers, rehearsal dinners, birthday celebrations, retirement and graduation parties! We recommend the following hotels where special Dazzle rates are available! Requesting a reservation on our website does not guarantee your reservation. Someone will be in touch with you shortly after your submission to discuss details with you and confirm if your request can be fulfilled.